The Canon LE-10 beside the charging unit. Distinctive features: Uses rechargeable battery pack, recharged with calculator in a charging unit. The calculator is fitted with a battery-check meter. Main integrated circuits in this example - Texas Instruments TMC1824NC and TMC1825ANC, here date coded to early 1972. 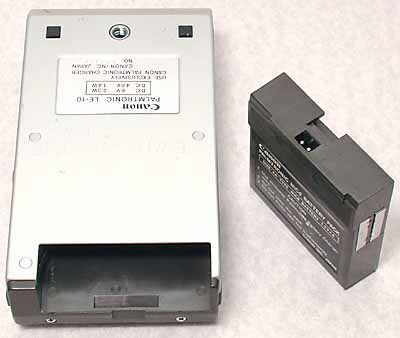 4.8v (sealed battery pack with 4x AA rechargeable cells, see photograph below). 83 x 145 x 38 mm (3.3" x 5.7" x 1.5"). The batteries are recharged by clipping the calculator on the charging unit and securing it with a serrated screw. The calculator is fitted with a battery-check meter. 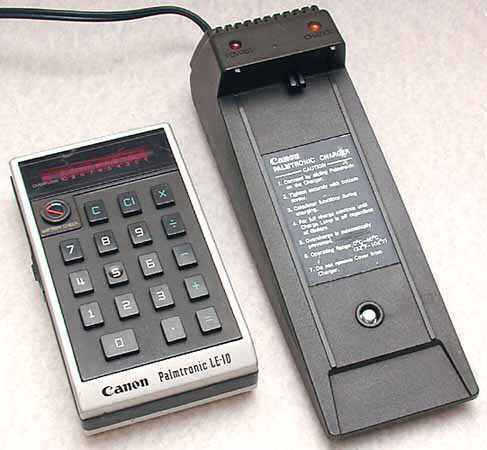 The Canon LE-10 recharging on the charging unit. Note the battery-check meter at the top left of the keyboard. The calculator uses a sealed battery pack which slides into the top of the calculator. 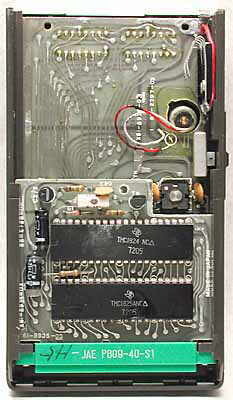 With the cover removed showing the two main, Texas Instruments, integrated circuits. There is another board below with the keyboard and display. Canon had an agreement with Texas Instruments for the development and production of calculator integrated circuits. The first Canon calculator, the Pocketronic, required 3 large integrated circuits. A year or so later, this model reuires 2 large integrated circuits.